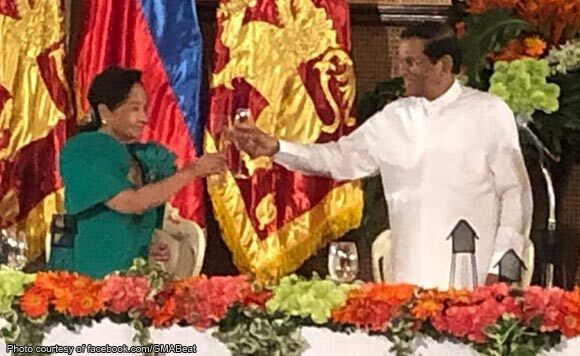 Former president and now House Speaker Gloria Macapagal Arroyo recently shared a toast with President Duterte and the leader of Sri Lanka. The congresswoman attended the state banquet in honor of President Maithripala Sirisena of the Democratic Socialist Republic of Sri Lanka at the Rizal Hall in Malacañan Palace this week. The three political heavyweights can be seen enjoying a light moment during their dinner, which can be seen from the photos uploaded by SGMA on her Facebook page. The Sri Lankan President was on his first state visit to the Philippines from January 15-19.